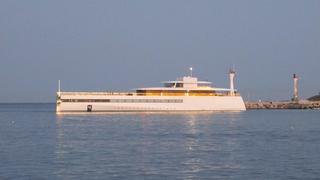 The first photos of superyacht Venus after her refit in France have been shared with Boat International. 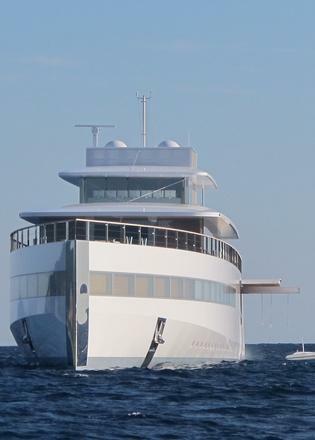 In August this year, 78.2 metre Feadship superyacht Venus, built for the late Apple founder Steve Jobs, was spotted as she was heading in for a refit at Monaco Marine in La Ciotat, France and photos were taken of her hauled out on the hard at the refit yard. 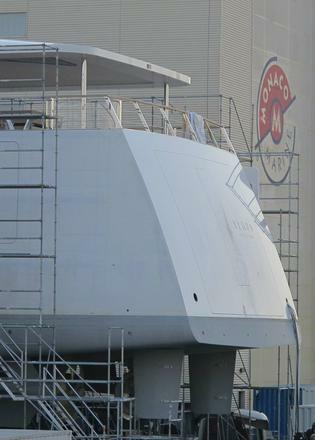 The new photos show Venus emerging from her refit with a gleaming hull, and close-up pictures give an look at intriguing details of the yacht. 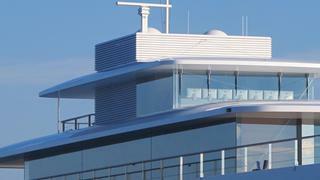 The bridge on Venus, for instance, is packed with Apple computers, fitting for a yacht designed for Steve Jobs. 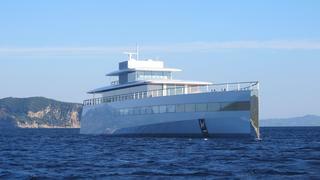 The photo above shows that there are seven Mac screens sitting in superyacht Venus' glass-enclosed bridge, a hint at the technology packed bridge that she is meant to have. One of the best Feadship superyachts of all time, Venus has a wealth of interesting design features, from her highly innovative glass exterior design to the reported high-tech amenities. The yacht is extremely secret, however, with no interior images ever seen, which is why a photo shoot like this is all the more interesting, giving us an up-close view inside Venus' bridge and a look at her tender garage, the latter seen in the photos below. 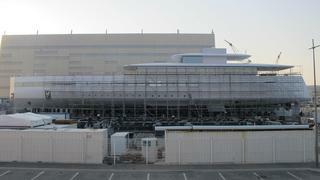 A RIB tender is visible stowed in the portside tender garage. 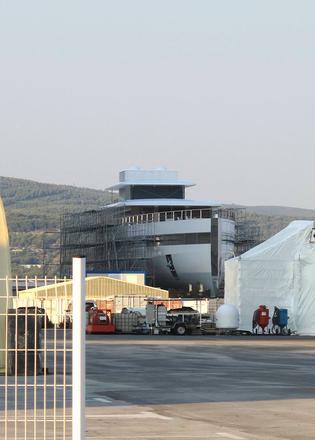 Photos of Venus seen earlier this year showed off some serious scaffolding built up around the yacht, but it was not confirmed whether she was in for maintenance or a more extensive refit. 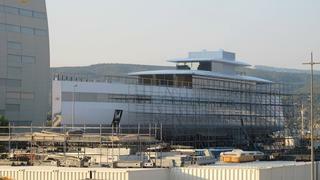 This isn’t the first time Steve Jobs’ yacht Venus has spent time at a refit yard; she was spotted at the Rybovich yard in Florida just a year after her launch in 2013. With an immense use of glass and high-tech propulsion and helm set-up, the boundary-pushing superyacht Venus is an interesting challenge for a refit team as she is far from your average superyacht. 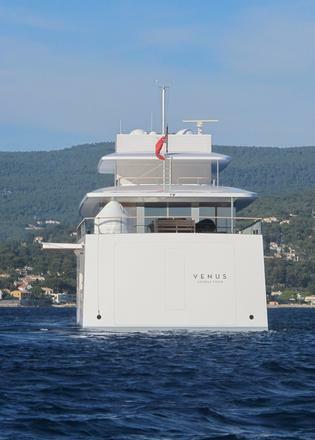 Engineering of the futuristic-looking Venus came from Feadship’s team at De Voogt Naval Architects, and a notable feature is her clever upper deck design that conceals communications and TV receivers. 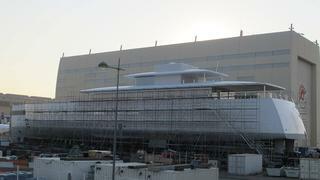 Venus has turned heads since her launch at the Dutch yard in 2012. 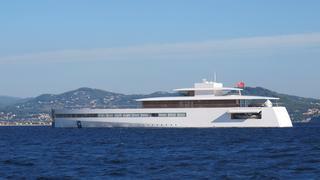 The yacht’s super-slick, minimalist design by Philippe Starck seemed a perfect fit for the Apple founder. 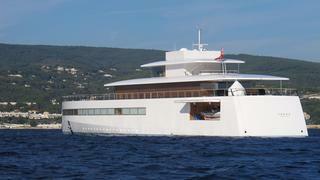 Sadly, Steve Jobs passed away in 2011 before the yacht was launched and never got to enjoy his vessel. But Venus has been making moves, recently spotted island hopping in Greece. Follow in the wake of Venus with this nine-day cruising itinerary of the locations visited by Steve Jobs' yacht in the Turkish and Greek islands.